There are many ways that a Customer Success team can add value to the enterprise. From our customer advocate program perspective, CS fills an important, and often missing, part of the puzzle. Ownership of the customer relationship has often been a murky or even touchy subject. Salespeople are busy bringing in new business and often lose touch with customers until it’s renewal season. Marketing doesn’t often have a good reason to build and maintain customer relationships other than to ask for something (case studies, videos, speaking opportunities, etc.). This leads to an imperfect situation where customer information isn’t always as accurate and complete as it ought to be, and requests for advocate activities are sporadic and out-of-the-blue. Given that “strength of relationship” is a top 5 reason for customers choosing to act as a reference, this is problematic. 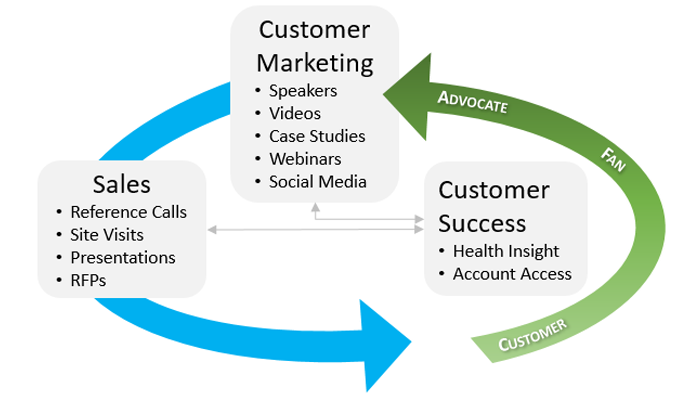 We think that the Customer Success function, done strategically, is the missing link, and here are how the pieces fit together. 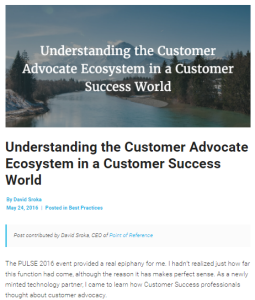 Read our guest post on the Gainsight blog for more details on our vision for the future of the customer advocate ecosystem. We welcome your thoughts.